Here are the questions and answers from an interview of this site's author Rob Wood, and his impressions about the role for fitness for tenpin bowlers. What defines an athlete, and how do bowlers fit that definition? I believe bowlers are athletes if they take their preparation for their sport seriously. Bowlers at the competitive level, who take the holistic approach to their sport (have a coach, train and practice), are certainly athletes. How fit must someone be to perform athletically? Fitness is defined as the ability to perform the sport at the required level. If a bowler can bowl the best they can throughout a whole day, without any limitations and without showing any signs of performance decrement, they could be considered fit for bowling. In my work at the Northern Territory Institute of Sport (NTIS) I have conducted some research to look at what are the physiological demands required to bowl. Knowledge of the physiological demands is needed in order to set training programs. For example, what energy systems are predominantly used, how important is strength and/or power, how flexible do you need to be? What types of fitness enhance bowling achievement? Being aerobically fit reduces fatigue and enables the bowler to stay fresh during long periods of play. In some tournaments bowlers are required to compete over several consecutive days. The bowling delivery may be repeated hundreds of times in any session, both in competition and training. Fatigue may impact on their performance in the later part of the tournament, both physically and psychologically. Physically they may lose their fine motor control, become lazy in the execution of the delivery. Psychologically, they may lose concentration and become frustrated. There may be a threshold level of aerobic fitness required for success, beyond which further increases in aerobic power have a limited contribution towards improving performance. Strength endurance is also important. Strength endurance is the ability to maintain strength contractions over a period of time. The repetitive action of the bowling delivery must be produced consistently over time. If strength levels decrease due to fatigue, then performance will also change. Many of the other aspects of fitness may not necessarily enhance bowling achievement, but if these fitness components are poor, then performance may be impaired. For example, someone with normal flexibility may not improve their game by becoming more flexible, but if they became tight in the shoulder, their technique may be affected. Medical screening and musculo-skeletal assessment by a physiotherapist is very important in my work with bowlers. From these assessments we get many of the areas that we are required to work on. What sort of bowling-specific fitness training exercise program or regime have you devised, and what does it accomplish in terms of fitness and performance? The training I provide for the bowling squad addresses these areas of their fitness. Aerobic fitness is very important, and the bowlers perform between 1-3 sessions per week depending on the level they are currently at. They also attend 2 sessions in the gym, where they work mainly on strength, balance and flexibility. I believe there are many benefits of fitness training above improvements in the physical conditioning that make it a worthwhile component of a program for tenpin bowlers. The bowlers have made a commitment to the sport, they have a professional approach, and consequently feel that they have an advantage over the opposition. 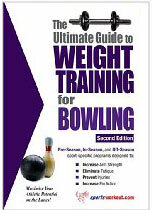 How did you come to specialize in bowling fitness and have such an interest in bowling in general? I am not a bowler myself (only the occasional recreational game). I work at the Northern Territory Institute of Sport (NTIS), in Darwin, Australia. I have a PhD in Exercise Physiology from the University of Western Australia. I have worked with a wide range of sports in this job and with previous work at the Western Australian Institute of Sport and the Australian Institute of Sport. I have been working with bowlers since starting at the NTIS in May 1999. We have a squad of elite level bowlers as part of the Institute. There are currently 7 bowlers in the squad. One is a member of the Australian senior men’s team, one a member of the senior women’s squad, and three are members of Australian junior squads. Three were members of a Northern Territory team that won the national teams event last year for the first time ever. In the Northern Territory, we have the only elite bowling squad associated with an Institute of Sport within Australia. I have conducted research on the relationship between bowling and performance, and presented at conferences and at coaches workshops on the science of bowling, and have a website called bowling science. How much effect does the lack of fitness have on bowling performance? As mentioned earlier, this is my main focus. The weaknesses of the bowler are the main things I look at when assessing a bowler’s fitness. The evidence is not clear if very high levels of fitness are beneficial to bowling (they are probably not), while it is easier to see that by minimising the bowler’s weaknesses can impact on their performance. For example an adequate level of strength is required to grip a high weighted ball and generate ball velocity. Once you have adequate strength to hold a 16 lb ball and carry that for many games, improving strength beyond this level may have limited benefit. The time in training may be better spent on other areas. The same goes for aerobic fitness. There is probably a threshold level of aerobic fitness, above which there is minimal impact on performance. However, if the fitness level of the bowler is below this threshold, their bowling performance may be affected, especially in the later parts of tournaments. Does bowling have any tangible fitness benefits in and of itself? Recreational bowling, such as a few games a week, would have only a small fitness benefit. Doing any activity is beneficial for health. I have read that the intensity of bowling is equivalent to walking the dog. Improvements in fitness requires you to overload the body so that adaptations occur – therefore only those pushing themselves above the usual demand will make improvements in fitness. Are you seeing any increase in awareness of the value of fitness in the bowling community? The NTIS program and the success of the bowlers at the national level has been noticed (The NTIS program does not just include fitness training; it also provides medical, nutritional and psychological services, coaching, and financial support). Since working with the NTIS bowlers, I have been invited to present at a national coaching seminar and work with the national junior squads. There would be some reluctance of areas of the bowling community to take on board fitness training, however the junior athletes coming through have been exposed to this and with the professionalism required these days for the top level bowler they will hopefully take this on board. The national body (Tenpin Bowling Australia) has a high performance program to ensure that there is a professional approach to bowling at the elite level, which includes physical preparation. Can the contribution of fitness be measured in X more pins per game? If not, why should a bowler bother to train if it's not realized in a better score? While I believe that there can be great improvements in bowling scores with physical training, it is a difficult thing to measure and prove. There may be case studies of bowlers who have improved their score after going through a fitness training program, but I am not aware of any proper scientific study to show this. The work that I am doing currently is based on many assumptions, making use of our knowledge of exercise physiology, our experience with other sports, and our understanding of the physiological demands of bowling. There have been several studies to show a relationship between some fitness parameters and bowling scores. What is lacking is a study to show on individuals that by improving certain aspects of the fitness, their score will improve. For example, several bowlers in my squad have had great improvements in fitness over the years I have been working with them, and their scores have improved too. But we are not able to distinguish between what is a result of their fitness training (if any) and what is a result of natural development of their game (they are mostly young) and the coaching that is also part of their scholarship. Determining the contribution of fitness training to bowling performance is an area that I am very interested in, partly to justify why we make the bowlers do fitness training several times per week. It would be possible to set up a study to look at this problem, but it is not a simple process. What fitness aspects are most important to a bowler—strength, endurance, flexibility? A bowler needs good grip strength to be able to carry and deliver weighted ball maybe hundreds of times in a session. They also need good balance and core control (abdominal strength). They need to be flexible enough to perform the range of movement required to perform the skill. They need an adequate level of aerobic fitness to stay fresh throughout a bowling tournament. All of these areas are trainable. I would not rank any of these more important than the other, though based on an individual’s current level in each of these components, I would modify their training to address the area of greatest weakness.